Apple Hospitality (APLE) began trading as a publicly listed REIT in 2015. The firm's property portfolio consists of 243 Marriott and Hilton branded hotels located in 88 mostly large and urban markets throughout 34 states. 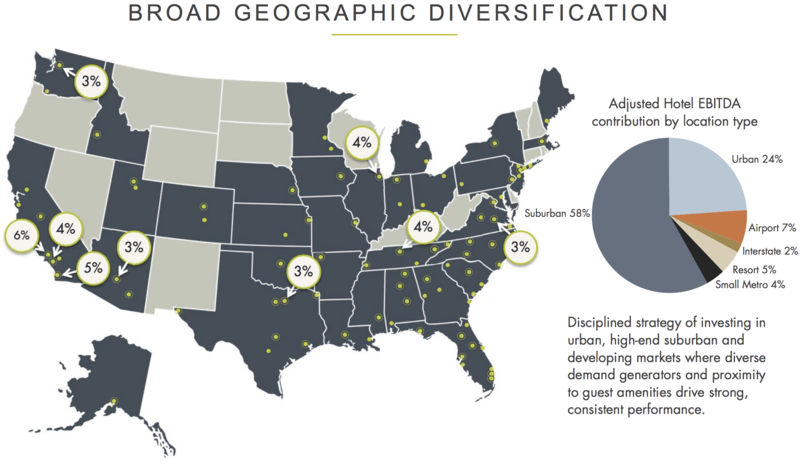 Almost all of the REIT's hotels are located in high traffic locations such as suburbs, cities, or near airports. The strong brand recognition and loyalty programs of Marriott and Hilton branded hotels help them maintain stronger occupancy, higher revenue per available room (RevPAR), and thus more stable cash flow. As you can see, the company's hotels include various sub-brands as well as different levels of premium units and extended stay lodging. At the recently held REIT Week conference, Apple's Hospitality's CEO Justin Knight said that the REIT was strongly looking into adding Hyatt branded hotels to its property portfolio. 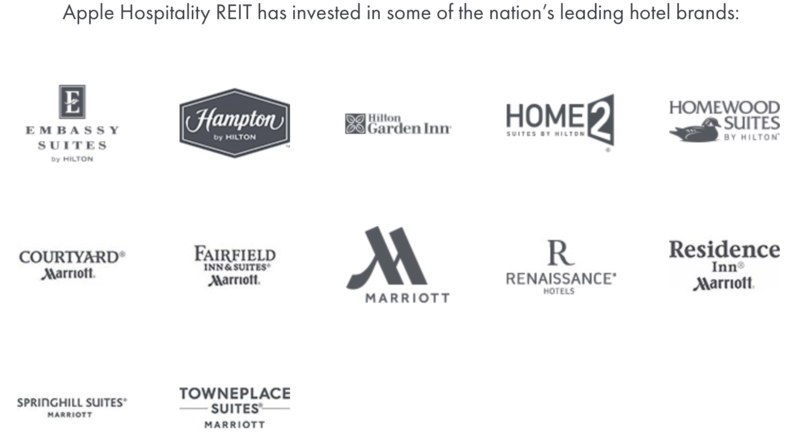 Unlike most REITs, hotel REITs usually have external management. Third-party managers usually collect two kinds of fees. A base management fee of about 3% of revenue, plus an incentive fee that represents a cut of operating profits. In the case of Apple Hospitality, all of its properties are leased to third-party operators who receive about 3% of revenues in fees based on achieving various industry-specific metric targets. 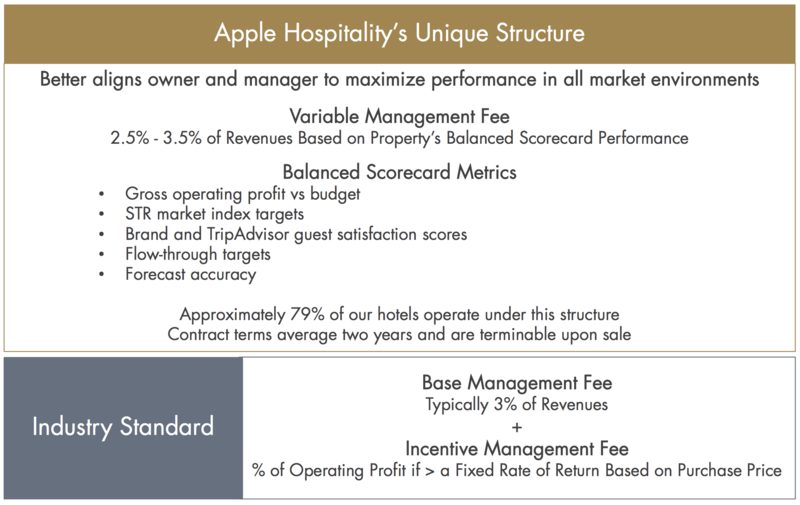 There are no separate incentive fees, meaning that Apple Hospitality operates under a lower cost structure than most of its peers. Apple Hospitality is also one of the few stocks that pays a monthly dividend. Apple Hospitality operates in what's called the selective service space, meaning its hotels usually only offer self-services such as: business centers, small gyms, laundry facilities, swimming pools, and complimentary breakfast bars. Despite lacking some of the amenities of full resort hotels, many of its properties can still charge similar, if not slightly higher, room rates than full-service hotels. Approximately 99% of Apple Hospitality's properties are select-service hotels and have an average age of just four years, resulting in relatively low maintenance and upkeep costs. That, in turn, means higher margins and more stable cash flow. In fact, upscale select-service hotel REITS like Apple Hospitality are the most profitable in the industry, with the firm's EBITDA margin in 2017 being 36% higher than Host Hotel & Resorts (HST), America's largest hotel REIT. Apple Hospitality is the largest select-service focused REIT in the country with a market cap of $4 billion, far larger than its key rivals Summit Hotel Properties (INN) and Chatham Lodging Trust (CLDT), who have $1.4 billion and $900 million market caps, respectively. In recent years, the hotel industry has benefited from rising demand due to an accelerating economy outstripping supply growth. Over the next 18 months this trend is expected to continue, resulting in solid RevPAR growth for the industry. While Apple Hospitality's 2018 guidance calls for just 1% RevPAR growth, the REIT still expects to achieve an impressive adjusted EBITDA margin around 36%. That's thanks to the relatively low cost structure of this business model. In addition, the company benefits from higher-than-average customer satisfaction (4.3/5 star average rating on TripAdvisor) which helps maintain strong occupancy (74.6% in the first quarter of 2018). Simply put, Apple Hospitality's combination of newer properties and skilled operations from third-party managers results in more satisfied and recurring customers, especially business travelers. Apple Hospitality, like all hotel REITs, primarily grows its funds from operations (FFO) per share, through portfolio expansion. For example, in recent months the REIT spent $107 million acquiring three new hotels in Memphis, Atlanta, and Phoenix. The REIT is in final contract talks to acquire three more hotels located in Florida. Overseeing this growth effort is an experienced management team with an average of almost 20 years of industry experience among all its top executives. The Apple Hospitality team has grown the REIT through more than 400 hotel acquisitions over their tenure, including the purchase of eight non-traded REITs. Periodically, management will sell existing properties at a profit in order to invest the proceeds into higher-yielding investment opportunities in what's known in the industry as "capital recycling". Over the years Apple has purchased $7 billion in hotel assets and sold $2.7 billion via capital recycling. Due to the short-term nature of contracts in the hotel industry (management contracts are for two to three years) and more variable nature of cash flow (based on daily revenue and the health of the economy), operators in the hotel REIT industry usually maintain much lower payout ratios than other REIT industries. For context, most REITs pay out 75% to 85% of FFO because they enjoy long-term (10- to 20-year) leases that create very stable and recurring cash flow. 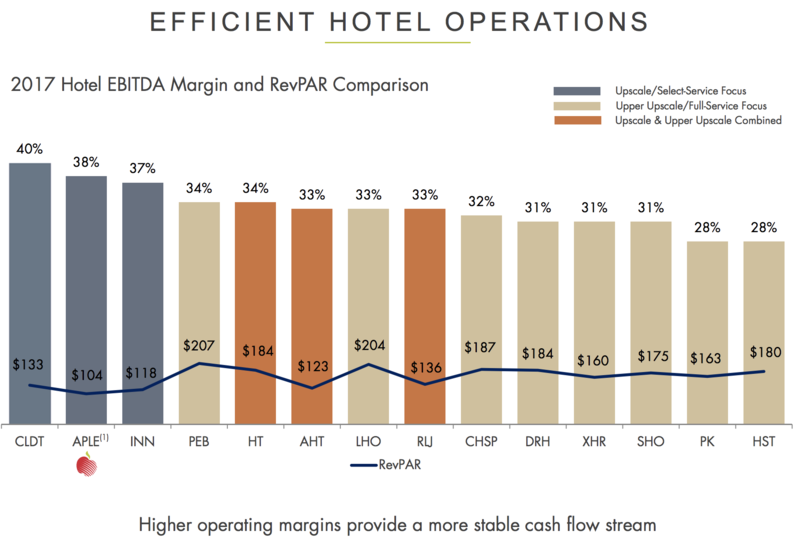 Apple Hospitality's FFO payout ratio sits just below 70%, indicating that the REIT is covering its monthly dividend well and retaining significant cash flow to reinvest in future growth. Another key advantage the REIT has is a very strong balance sheet. Most REITs maintain a debt-to-capital ratio above 50%, but Apple Hospitality's ratio sits at 25%. Similarly, its debt-to-adjusted-EBITDA ratio is near 3 times, which is about half the industry average. The company's low relative debt levels allow it to enjoy low borrowing costs (an average interest rate below 4%) as it continues growing its portfolio, cash flow, and dividend over time. Over the long term, analysts see Apple Hospitality increasing its FFO per share by about 5% annually and its dividend by about 4% per year. There are two reasons for the firm's slightly slower dividend growth rate. First, the cyclical nature of cash flow in the hotel industry means that Apple Hospitality needs to maintain a strong safety buffer if it wants to create a sustainable dividend over a full economic cycle. Secondly, a slower dividend growth rate would allow the REIT to retain more cash flow over time, further lowering its cost of capital and making it easier to grow profitably independent of the debt market (rising interest rates) or fickle equity markets (share price risk). Despite Apple Hospitality's improving risk profile and focus on more profitable select-service properties, the hotel REIT industry is not for everyone. There are several risks that investors need to be aware of that might make it a relatively poor choice for conservative income investors. Hotel REITs are not like most REITs in that their cash flow can be extremely variable. For one thing, hotel demand is cyclical and tied to the health of the economy. With nearly 10 years of uninterrupted economic growth behind them, hotels have enjoy very strong recovery in demand, causing occupancy and revenue per room rates to rise steadily over time. Part of the reason for the strong growth in RevPAR in recent years was that for a long stretch of time (through 2014) new hotel construction was essentially zero. However, due to rising RevPAR, in recent years new construction has ramped up and tightened the demand/supply gap. As a result, even with ongoing strong economic growth hotel revenues per room are likely to grow slower (about 2% per year). Hotels also have high fixed costs, especially in terms of labor. With the U.S. labor market looking strong and numerous states raising minimum wages, hotel operators are seeing rising labor costs that are starting to eat into operating margins. For example, Apple Hospitality managed to hold its labor cost growth to just 2.7% year-over-year in the first quarter of 2018 but that still translated into a 50-basis-point decrease in EBITDA margin. Unlike some other companies where automation is an option, hotels can't do much about rising labor costs because cleaning rooms to prepare them for new occupants is an essential part of the business. When combined with the cyclical decline in cash flow that comes with lower hotel demand in a future recession, you have a relatively large amount of uncertainty surrounding Apple Hospitality's ability to maintain its dividend during the next economic downturn, at least relative to other REIT industries. Finally, we can't forget about equity risk. Since all REITs must pay out a substantial amount of their cash flow as dividends (for tax reasons), the sector is heavily dependent on funding its growth through debt and equity (new share issuances). While debt markets are usually open to REITs even during recessions (financial crises are an exception), equity markets are notoriously volatile and can make it harder to grow profitably. For example, in the most recent quarter Apple Hospitality actually bought back 250,000 shares at an average price of $16.89 per share because the FFO yield (cost of equity) on its shares had risen so high that it was more profitable to repurchase shares than invest in more properties or property improvements. If a REIT's share price falls low enough for long enough, then it can struggle to grow FFO per share over time. That's because REITs need to maintain a low enough cost of equity to balance out new share issuances with debt in order to grow. By retaining a reasonable amount of cash flow, periodically recycling capital, and maintaining a conservative balance sheet that provides access to low cost debt, Apple Hospitality has positioned itself to grow profitably over time, at least for now. However, in a future recession hotel REITs are likely to see falling occupancy, RevPAR, and cash flow. That will likely mean investors become more nervous about the safety of the dividend and cause share prices to fall substantially (lodging and resort REITs plunged 22% in 2007 and 60% in 2008). Such a scenario would result in much higher costs of equity and capital, limiting how quickly a REIT like Apple Hospitality is able to grow. Hotel REITs like Apple Hospitality can be a decent source of generous monthly income when the economy is on solid ground. This REIT in particular has a good (if short) track record of profitable growth and conservative leverage, at least as a publicly traded REIT. The company's management team also has a solid strategy of targeting the most profitable segment of the industry (select-service hotels), and a future partnership with Hyatt branded hotels creates a potentially strong long-term growth catalyst. Just be aware that practically all hotel REITs are medium-risk stocks due to the cyclical nature of their cash flow. They may not be not suitable investments for more conservative income investors.